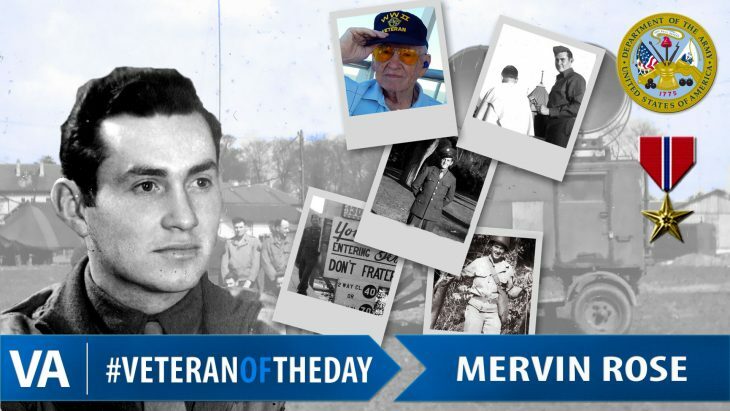 #VeteranOfTheDay Army Veteran Mervin Lewis Rose Sr.
Today’s #VeteranOfTheDay is Army Veteran Mervin Lewis Rose, Sr. Mervin served during World War II. Mervin was born in 1922 and obtained a barber license at the of age 16. In 1942, he enlisted in the Army and was assigned to the 394th Signal Corps. His unit was responsible for radio communications with England and between Allied bombers and fighters. Mervin landed on Omaha Beach just two days after D-Day. His unit spent the winter near Paris and then moved alongside other Allied troops as they drove into Germany. He was honorably discharged in December 1945, having obtained the rank of Staff Sergeant. For his service, Merv earned the Bronze Star. After his discharge, he served in the Army Reserves until 1952. Mervin returned to his barbering career in his home state of Ohio after his discharge from active service. He retired at the age of 85, after completing more than 150,000 haircuts. He is currently 96 years old and living in Port Clinton, Ohio. He enjoys remembering his service and all the fish he has caught over the years –as fishing was one of his hobbies. Thank you for your service, Mervin! Veteran sacrifice Memeriable all international Community. Veterans of The Day great day peace and Harmony every day,everyone life. Many thanks for (Army Veteran) Mervin Lewis Rose’s troubles ! Amm, would you listen radio program related with God sometimes. ?